Electrifying rock of this magnitude did not go unnoticed by the elder statesman of the Sunset Strip, the incomparable, irreplaceable Lemmy Kilmister of MOTORHEAD. After seeing BARB WIRE DOLLS live, Lemmy took an immediate interest in the band and placed them under his supportive wing. Fast forward to today... on July 29, 2016, BARB WIRE DOLLS will release their Motörhead Music debut - their third full-length album Desperate. Pre-orders will be available soon. The ten song album contains gripping rock tracks, empowering anthems, and hard-edged thrashers, all performed with the classic punk rock energy the band has become internationally known for. As members of Motörhead Music, BARB WIRE DOLLS are represented by Lemmy's long-time manager Todd Singerman, MOTORHEAD's booking agents, and parent label UDR/Warner Music Group. 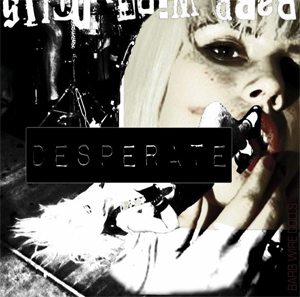 Desperate's release through Motörhead Music serves as an edgy, thrilling first chapter in the life of a label whose mission is to present the most fiery new bands in rock and roll. Recorded at Sonic Ranc and NRG studios, Desperate was produced and mixed by Grammy award-winning producer Jay Baumgardner and mastered by Grammy award-winning mastering engineer Howie Weinberg. Fronted by the whip-smart vocal and fashion icon Isis Queen (named after the Greek Goddess herself), BARB WIRE DOLLS' dynamic musicianship is blasted forth by former pro surfer and skateboarder Pyn Doll on lead guitar, Krash Doll on drums, Iriel Blaque on bass and Remmington on rhythm guitar. Since forming, the band has gone on to melt ears and hearts on 700 stages across 22 countries in just under five years - consistently selling out club dates in America, the UK and Europe. Desperate is being released in conjunction with the band's debut performance at Germany's Wacken Open Air, the largest metal festival in the world. Out to take over the punk rock scene while smashing all misconceptions about women in rock today, BARB WIRE DOLLS' cultural and musical immediacy is not to be missed.